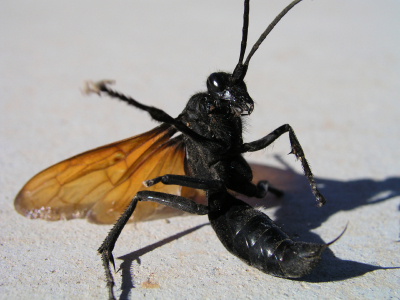 One of the biggest types of wasps found in the United States is the tarantula hawk wasp. This massive wasp measures almost two inches long, and has a very dark blue body with orange colored wings. The wasp has really long legs that are equipped with hooks used to wrestle with tarantulas. Along with their unprecedented size, Tarantula hawk wasps are know for their notoriously painful stings; the second most painful sting know to man right after the bullet ant. Get this; their stingers alone can measure almost 1/3 of an inch long. This wasp primarily feeds on plant nectar, but requires a tarantula host for its eggs. The Tarantula Hawk Wasp gets its name because it’s a natural predator to the tarantula. When it’s time for this wasp to reproduce, it will look for a tarantula. After locating one, the tarantula hawk wasp will sting the tarantula, paralyzing it. The wasp then drags the tarantula to its burrow where it lays its egg on the tarantula’s back. The egg will hatch and begin to feed on the live, but paralyzed, tarantula. It’s quite a spectacle to witness the entire process. The tarantula hawk wasp is the state insect of New Mexico, decided by a statewide election.